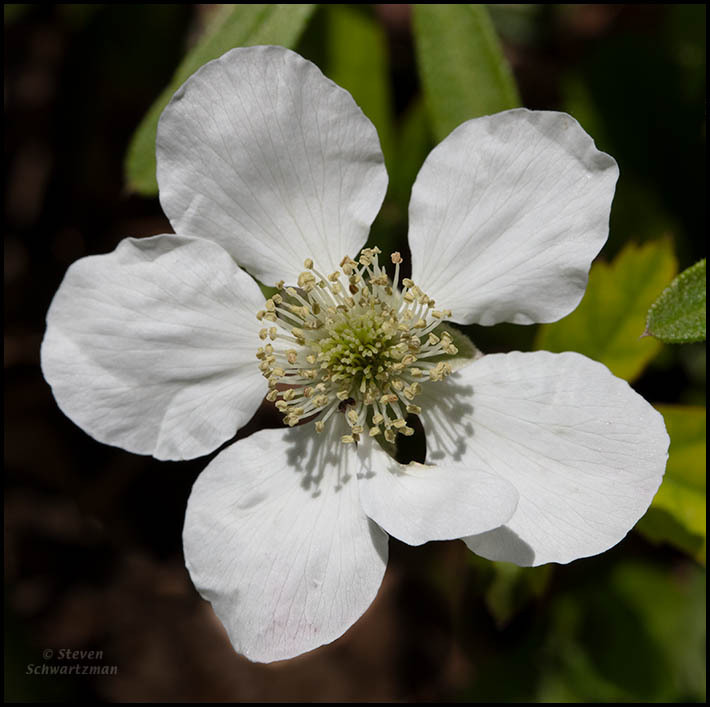 While at Mills Pond on February 24th I found my first southern dewberry flowers, Rubus trivialis, for 2019 (and I’ve continued seeing others since then). In case you’re wondering about the scale, each flower in this species is about an inch (2.5cm) across. Can you tell that this little wildflower is in the rose family? When I got closer for a few portraits of the flowers I noticed a bud that had begun to open. As my skin keeps confirming, southern dewberry canes (stems) are very prickly, another resemblance to rose bushes. In the lower left corner of the bud picture you get a side view of one prickle, softened not in reality but by appearing out of focus. In contrast, what look like dark red “claws” on the bud aren’t prickly. Notice also that the prominent pink in the bud has faded to a faint trace in the open flower. « Maximilian sunflowers in February! A lovely study of this flower, highlighting the rose connection. You know what they say: Let’s keep it in the family. It’s so odd. In the past, I’ve found many buds displaying that pretty, rosy color, but this year they’ve all been the purest white imaginable. You’ve captured that pink blush beautifully; I do think their buds are delightful. I found my first of the year on February 17, at the San Bernard refuge, but they’d clearly been blooming for a while. Now, they’re everywhere. Yesterday, I saw my first huisache blooming, and a few spider lilies in a ditch. It’s getting hard to keep up. I wonder if you’re onto a pattern. 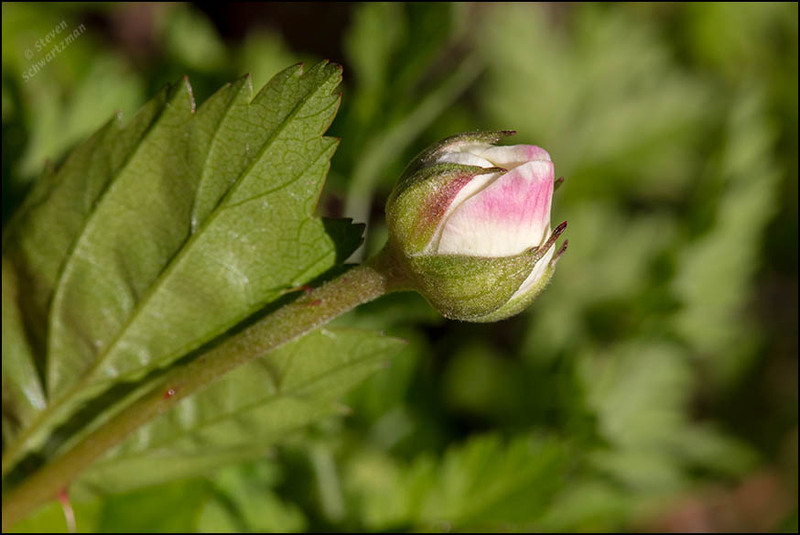 On February 27, close to the Maximilian sunflowers, I photographed two other dewberry buds that were beginning to open. One had a little pink while the other was totally white. That’s hardly enough evidence to draw any conclusions: maybe the amount of pink in the buds always varies if you look at enough of them. I’ve been hoping for good huisache blossoms this year but am still waiting. Over the past 20 years I’ve observed them as early as late February and as late as April—and in some years not at all. And yes, now that we’re apparently past the last freeze, things will be going crazy. Our Redbuds and Mexican Plums have their first blossoms [pictures to come], too, and luckily the recent freeze seems to have done no damage. Bring on your pictures: show people up north how floral Texas already is. The bit of freezing in Austin didn’t seem to harm the redbuds here, either. Some time soon. Later today and tomorrow I need to be at our old place in Karnes City, to supervise the tiling of the kitchen. Those are beautiful photos, Steve! It will be a while before we see anything like that here. Winter finally came in February and March. The snow is almost melted here, but it was a frosty 24 degrees this morning. Glad you like the pictures, Lavinia. Dewberry flowers are small but make up for their size by being quite common at this time of year. Yes, you’re still in winter up there, while down here spring is about to burst into full swing. Even in Oregon, though, it shouldn’t be much longer. Lovely photos. I’ve been photographing the wild Asphodels not too far from where I live but a lot warmer so more wild flowers are out there and definitely Spring. Yes, I saw your post. You must be happy to have gotten to a relatively warm place, even if not warm enough for a dip in the pool. Indeed! But only about 2 hours away from us but we are about 500m and north facing. There are lots of varied micro climates around here. Then may those micro climates bring you maximum enjoyment. It seems obvious to me that it is in the rose family because I tend to compare more related plants to the stone fruits and cane berries than to roses. Roses are actually more of the aberrations. That fits with my observations as a photographer: I’ve seen more species in the rose family that don’t look like rose than species that do. Our wild rose has a similar flower, so I could recognize the family even without the characteristic flower bud. Beautiful close-ups, Steve. The petals do look like rose petals. I love the promise of a flower bud. Fortunately, many such promises are beginning to be kept here these days. That thorn will dig a deep canal in your arm. Pink lady’s slippers do just the opposite. The buds are white and then pink shows up once open…unless it is a white variant. Dewberry prickles have often enough gotten caught in my skin, but it’s the thorns on the greenbriers that have dug deeper and drawn blood. As for color changes in developing flowers, I wonder if anyone has ever compiled a list of all of them for one region. Not that I am aware of. I certainly would not enjoy a scrape from greenbriers, but the worst pain I have felt from something like that was stinging nettles. The skins swells up, like welts, and it is quite painful and relatively long-lasting. A big ouchy.